See the fun things for Cats and Cat Lovers inside Day 2 of our Cat Christmas Advent Calendar. This adorable Cat is getting into the Holiday spirit with visions of wrapping paper and boxes to climb into on Christmas Day. Who knows what other exciting things await, but for know our little feline waits for Santa to arrive. 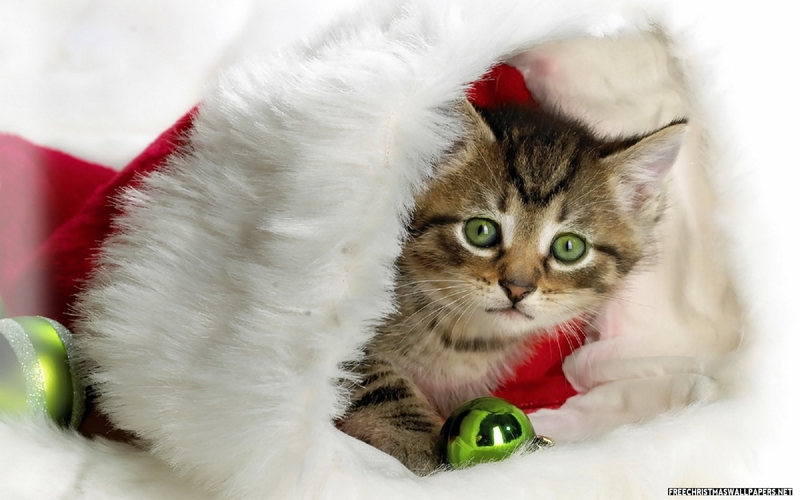 Here is a cute picture of a Kitten sleeping in a Stocking you can download and add to your computer’s desktop. Keep your Cat safe and happy this Holiday Season by watching out for these Holiday Cat Hazards in this handy infographic. We are very familiar with the fastidious behavior of Cats. Next to sleeping, Cats spend a large amount of time grooming. When you bring home a new Kitten or Cat be sure to begin a grooming routine they can get into straight away. Your Kitten or Cat will get used to and even look forward to baths, brushing and trimming claws when you keep a regular schedule. A few treats as a reward afterwards will make it even more fun! This Rainforest Tropical Getaway looks awesome! It’s easy to assemble and the best part is the universal joints connect to other kits when you are ready to expand your Kitty City. Cat Trees make a great gift for indoor Cats. The Pet Palace Cat Tree, featuring 3 levels, will keep your Cat active where they can have fun climbing, playing and sleeping. You’ll find more ideas for Cat Activity Trees here.